New construction- Four bedroom private home on Musky Bay of the Chippewa Flowage only 1/2 mile from Treeland Resort. The Chippewa Flowage is a 15,300 acre lake and is known for its premier fishing. This beautiful lake home boasts four bedrooms, 2.5 baths, native stone wood burning fireplace, floor to ceiling windows with expansive views of the Big Chip from the great room, the family room or any of the four bedrooms, complete with Wi-Fi, telephone and DirecTV. 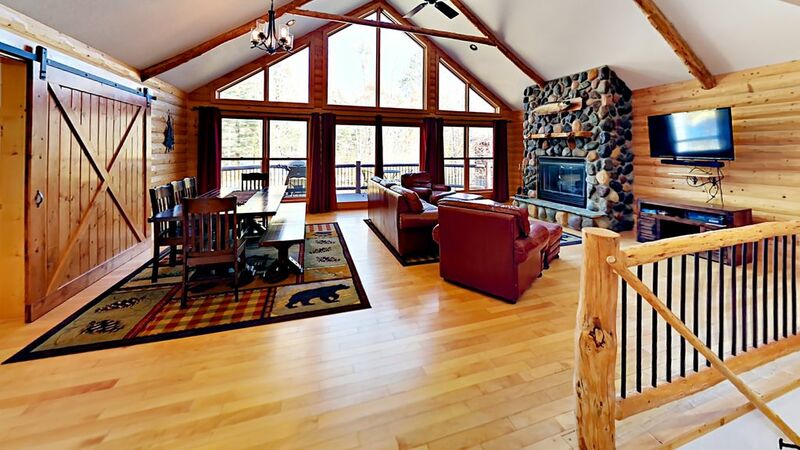 Interior is newly decorated with a Northwoods cabin feel-knotty pine log interior with hardwood floors throughout the main floor and log pine trim throughout. Plenty of space for your group to gather for games or send the kids to the family room to create their own fun. Both the Great room and family rooms have 50 inch Smart TV's. Sizzle your steaks on the LP gas grill as you enjoy a tall cold one overlooking the lake from the expansive deck on the main level. The fully furnished kitchen is very well appointed with granite counter tops, all stainless appliances and all of the furnishings for even the most discriminating chef. This home also boasts a washer and dryer for your convenience. On your walk across level grounds to your private dock and shoreline, a fire pit awaits you to enjoy the solitude of the call of the loon and the starry nights of northern WI. A place for quality time with your family, friends or a business retreat. Flat access to the lake, beautiful yard, and the cabin is spacious with dual living rooms to spread out and "Get away from the kids:" for a while. Room for a trailer as well as parking in the garage for two vehicles or park your toys to keep them out of the weather. This cabin was hassle free and everything as promised. Communication was quick and simple and directions/access to the cabin was easy as well. The space was great with an open floor plan on the main level, plenty of bedrooms and a lot of windows to let in natural light. Everything was very comfortable and it was an overall great experience. I highly recommend Musky Bay if you're looking for something in the Hayward area. Very nice and clean cabin. Love the overall experience of staying here. Beautiful home, comfy beds, and lots of space! It was a great get away with family :) Just remember to bring towels (they do have paper towels) for the kitchen and bathroom. I know we would love to go back! I'm so glad to hear you enjoyed your stay with us. Thanks for the positive feedback and come back again sometime soon! Nice roomy home with great views of the lake. Nice location between Hayward and the Flowage. Jon was easy to work with and very responsive to emails. We booked this property and celebrated our family Christmas here based on the pictures and how beautiful the cabin looked in the pictures. Although the pictures are fantastic, these pictures truly don't do this cabin justice! This is an absolutely amazing cabin!! The main floor with the family room, large bay windows, and fireplace truly gives this cabin the Northwoods feel and getaway we were all looking for. There was a tremendous amount of seating around the fireplace that can accommodate larger groups comfortably. In addition, the dining table easily accommodated 8 of us with room to spare. The lower level family room also provided for an excellent get away area for the kids. There was yet another large flat screen tv down there as well as the ping pong table which provided for some fun family entertainment! Finally, and just as important, is the responsiveness of the cabin management team. They are absolutely the best we have come across! Incredibly timely with their responses and extremely accommodating with any of our requests. In addition, 4 Christmas gifts were accidentally left behind and we reached out to the cabin management team right away. They found all the gifts, including cash, and made arrangements to get everything returned to us. A true testament to this team's integrity. We will definitely be staying here again or other properties managed by this team! The Chippewa Flowage lake in Hayward is the third largest lake in Wisconsin. What makes this lake unique is that there is very little development along the shores unlike many of the lakes in the area. Many visitors to the area say the lake reminds the of the remote wilderness state for you would expect to see in Canada. The fishing is excellent and there are miles of twisting shoreline to explore.